American River College’s baseball team outlasted Diablo Valley College in a 9-8 win through 14 innings of play, after ARC was up early after a six-run first inning provided them a three-run lead. The game-winning play came from third baseman Colton Freeman on a play in which he singled, then stole second and was able to score the game winning run off of a wild pitch two batters later. “Sometimes in baseball you just get the luck of the draw,” said relief pitcher Tommy Balmain. ARC first baseman James Boitano pinch-hit for catcher Bryan Babcock in the tenth inning and singled with two outs and what turned to be the tying run. “Last thing I expected, never thought we’d win on a passed ball,” said Boitano. ARC’s scoring was started by first baseman Dalton Devries, who singled and scored the first of six runs in the opening inning. Devries went 3-for-6 with a double and one run scored. Third baseman Austin Call went 2-for-6 with three runs and a double against DVC. ARC starting pitcher Mikey Ramirez threw for 5 ⅓ innings, allowing four runs on 12 hits with a pair of walks. Relief pitcher Mike Marlar also picked up his first win of the year against DVC. Marlar threw for five innings allowed only one run on four hits with one walk and a strikeout. DVC answered back in the seventh inning from Josh Stevens’ two-run single set up by throwing a passed ball to move over the leadoff man and walking the batter prior to Stevens. ARC committed four errors in the game while DVC had one. Balmain said he felt ARC didn’t play well during the middle innings due to those mistakes. “We put unnecessary pressure on ourselves, but we play better with a little pressure,” said Balmain. 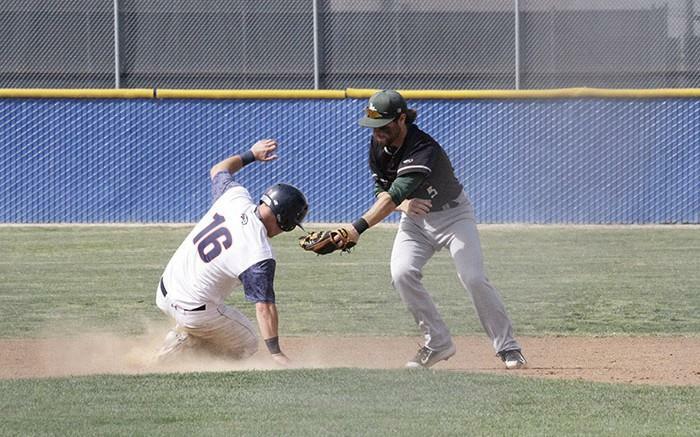 Despite the win, ARC was not selected to a playoff spot by the CCCAA. It was in the running with several other teams for the 18th seed, but the spot went to De Anza College (18-18 overall, 13-9 conference). ARC will finished its season with a record of 17-19 and 9-12 in conference. Be the first to comment on "ARC walks off its season with 9-8 win"